The Jupiter-C Intermediate Range Ballistic Missile (IRBM) was designed by the Army Ballistic Missile Agency (ABMA). The vehicle consists of a modified Redstone ballistic missile with three solid-propellant upper stages. The tankage of the Redstone was lengthened by 8 ft (2.4 m) to provide additional propellant. The instrument compartment is also smaller and lighter than the Redstone's. The second and third stages are clustered in a "tub" atop the vehicle, while the fourth stage is atop the tub itself. The second stage is an outer ring of eleven scaled-down Sergeant rocket engines; the third stage is a cluster of three scaled-down Sergeant rockets grouped within. These are held in position by bulkheads and rings and are surrounded by a cylindrical outer shell. The webbed base plate of the shell rests on a ball-bearing shaft mounted on the first-stage instrument section. Two electric motors spin in the tub at a rate varying from 450 to 750 rpm to compensate for thrust imbalance when the clustered motors fire. The rate of spin is varied by a programmer so that it does not couple with the changing resonant frequency of the first stage during flight. The upper-stage tub was spun-up before launch. During first-stage flight, the vehicle was guided by a gyro-controlled autopilot controlling both air-vanes and jet vanes on the first stage by means of servos. Following a vertical launch from a simple steel table, the vehicle was programmed so that it was traveling at an angle of 40 degrees from the horizontal at burnout of the first stage, which occurred 157 seconds after launch. At first-stage burnout, explosive bolts fired and springs separated the instrument section from the first-stage tankage. The instrument section and the spinning tub were slowly tipped to a horizontal position by means of four air jets located at the base of the instrument section. When the apex of the vertical flight occurred after a coasting flight of about 247 seconds, a radio signal from the ground ignited the eleven-rocket cluster of the second stage, separating the tub from the instrument section. The third and fourth stages were fired in turn to boost the satellite and fourth stage to an orbital velocity of 18,000 mph (8 km/s). This method of orbiting a payload obviated the need for a guidance system in the upper stages, and was invented by Werner von Braun in 1956 for his proposed Project Orbiter, which would have been just like the Jupiter-C but using the even smaller solid-fuel upper stages which were the only ones available at that time. His method was the simplest and most immediate method for putting a payload into orbit, but as it had no upper-stage guidance, it was not put into a precisely specified orbit. 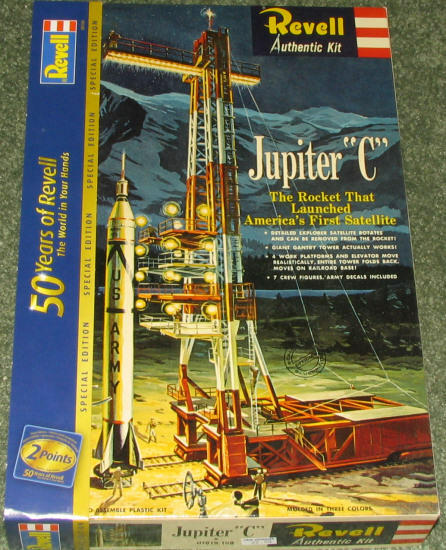 When used as a satellite launch vehicle, von Braun referred to the Jupiter-C as the Juno or Juno-I, to make it appear as peaceable as the Vanguard rocket, which was not a missile, that is, a weapon of war, but was developed from a weather study rocket. Sometimes the Jupiter-C is still so referred. Americans cheered on the orbiting of these early Explorer satellites, not realizing that it was by a means inferior to that of the Russians - or of the U.S. Navy's Project Vanguard. Von Braun had the method used again in the Juno II, which used a real Jupiter first stage rather than a Redstone. No other nation has since used this method. The Jupiter-C was used as a test-bed for testing re-entry nosecones that were later to be deployed on the more advanced Jupiter IRBM mobile missile. For starters, you get the original box top, complete with period prices, part number and adverts on the side. The only way you can tell this from the original is by the thinner cardboard and the fold lines on the corners. The underside of the box has the proper copyright date, scale, where it is made and all that other stuff in multiple languages. There is also a band around the box with the proper kit number and a 50th anniversary logo. 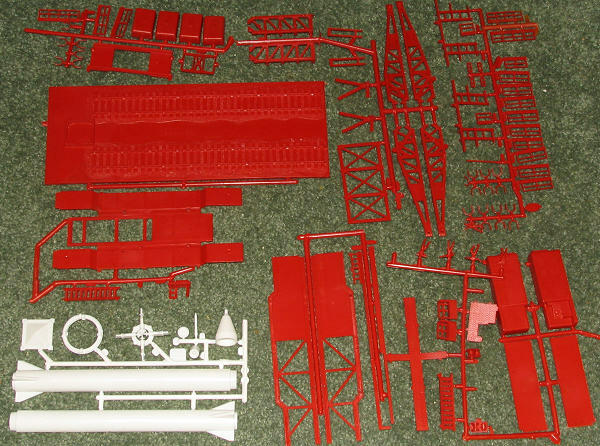 When you open the box, you are faced with a large bag containing a lot of red plastic for the launch gantry and base, and a smaller bag within of white plastic with the actual rocket itself. Typical of Revell kits of the period, many of the parts had managed to work themselves free from the sprues and were floating around inside the bag. Showing all the sprues that come with the kit would be an exercise in futility with all the loose parts, so I've just shown a few representative ones in the image. The actual number of red parts would triple if I showed them all. For being nearly 50 years old, the molds have held up exceptionally well. The parts are virtually flash free, something one doesn't always find in new Hasegawa/Tamiya kits. I found a bit of mold release material on some of the bits, which means you'll be well advised to wash the parts. Ejector pin marks are in some easily seen places so the fastidious will have a bit of work to do in this regard. I also found some sink areas, but few of them that will be visible when the kit is finished. I'd have to say that overall, the molding is excellent, especially considering when it was engineered and how old it is. Basically, you are paying for the launch setup. The missile is only about a dozen parts and one can get that built very quickly. It is the gantry and work platforms that make up the bulk of the kit. From the look of things, most of it is in red with a large white segment on the gantry. Several of the detail parts are in other colors and the generator has decals on it. This means that a plan of attack in terms of painting will be needed and many parts pre-painted prior to assembly. As was so typical of Revell in the 50s and 60's the kit has working parts. Specifically the gantry can be folded down along with the work platforms. There is also an elevator which can be made mobile. My recollection of these kits is that the working features didn't last long as the hinges and other attachment areas quickly broke. For play value, the kit includes several figures and an excellent display base complete with tracks. Instructions are right out of 1958 and not only list every part, but give color information (generic, of course). The instructions are easy to read and are not the sometimes horrible reproductions that one finds in some re-popped kits. In even includes a parts list for missing/broken parts, but sending it to Venice, CA will only get your letter returned as this kit was produced in Poland! The decal sheet is nicely done and I guarantee it will work much better than any 48 year old set that was with the original. 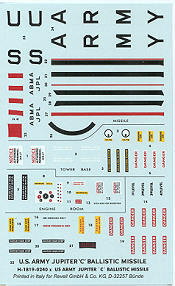 Decal placement is typical of the time and they are put on as the kit is built. I confess that I have a penchant for real space kits. This is especially true of the really old ones, most of which are/were high priced collectors items. I'm sure the collectors are gritting their teeth about a kit that was going for hundreds now being available for under $25. But this won't last as it is a single run for these kits so get them before they are gone. Thanks to me and my credit card for this one.